Sweden’s ICEHOTEL, the original ice hotel, is quite literally one of the coolest places to stay on earth. When it opens this year’s cold rooms on December 11 for the 26th season, it will be even cooler. This year the ICEHOTEL will have its own signature beer, Torne Islager (Torne Ice Lager), made from the same ice that builds the ice hotel every year. Every year the ICEHOTEL harvests ice from the Torne River, which, during the warmer months, flows behind the ICEHOTEL in Jukkasjärvi. The Torne River ice is used for the ICEHOTEL cold rooms, the ICEBAR, and also ICEBARs around the world and ice sculptures and ice glasses that are exported worldwide. For the first time, the Torne River ice harvested by the ICEHOTEL will also be used to brew beer. Nya Carnegiebryggeriet (New Carnegie Brewery) is the Stockholm brewery that is heading this endeavor. Ice from the Torne River was harvested and transported to Nya Carnegiebryggeriet where the ice was held while it melted. Brewmaster Anders Wendler had the idea to make beer from a fun water source. What better water source to tap than that of the pure Torne River? Thus the idea of a collaboration with the ICEHOTEL was born. The melted ice from the Torne River is some of the purest water in the world, so it makes the perfect ingredient for an ice cold lager. They will brew 4,000 liters (80 full-size kegs) which will supply the ICEHOTEL for their winter season until it starts to melt in the spring. New Carnegie Brewery will also have some bottles to serve in their restaurant at the brewery. 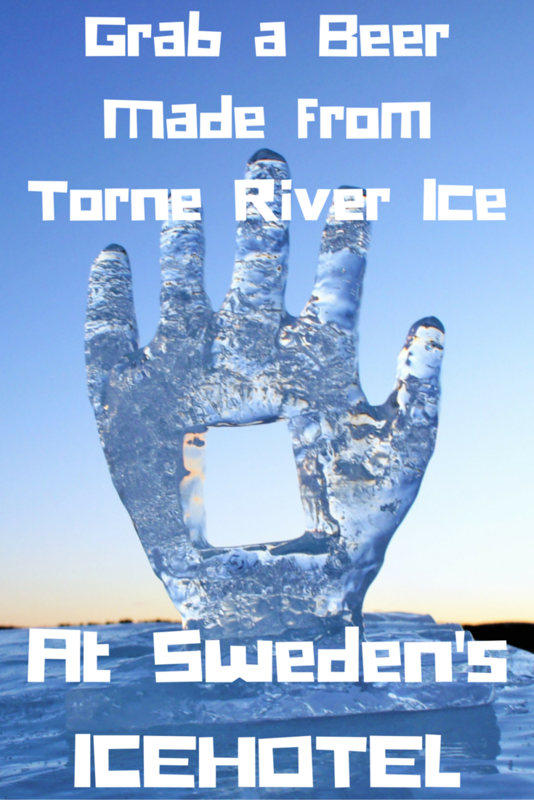 New Carnegie Brewery is using the melted Torne River ice to make Torne Islager (Torne Ice Lager), a Vienna lager. The brewery and ICEHOTEL came up with a beer style they both liked and that would taste good in a cold environment. The Vienna lager is both refreshing and full of flavor, and it pairs well with the ICEHOTEL's restaurant menu. The Torne Islager is brewed with Pilsner and Vienna malts, and the hops are Perle, Hallertau Mittelfrüh, and Cascade. The combination of malts, hops, yeast, and ice from the Torne River, which has a low salt content, allows the beer to be "a nice fest in the bottle" according to Anders Wendler. The Torne Islager will be ready just in time for the opening of the ICEHOTEL on December 11. The Torne Islager will be served in both of the ICEHOTEL's restaurants as well as the ICEBAR. There are multiple good reasons to stay at the ICEHOTEL in Sweden this winter. First, Sweden’s ICEHOTEL is the original ice hotel, and staying in a cold room is bucket list worthy. Second, now is the time to go to Swedish Lapland to see the Northern Lights as the 11-year solar cycle is winding down and it may be another 10 years before we’ll be able to see such spectacular Northern Lights shows again. And now third, it is the inaugural year for the ICEHOTEL’s signature beer, Torne Islager made by Swedish brewery New Carnegie Brewery, and this may be the only season that this special beer will be available.